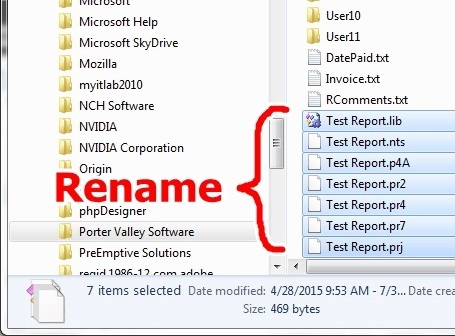 In most cases, renaming a report is a simple and fast process. But in some instances, and on certain machines where user permissions are set to strict, the Renaming Process will fail. When this happens, it is best to contact Porter Valley Software Tech Support Personnel. An Active Service Subscription is required for this option. In some cases, you may wish to attempt to the resolve problem yourself. To do that, simply follow the steps below. If you are unable to rename a Report using the Rename feature within InspectVue, You may try renameing the report by following these steps. 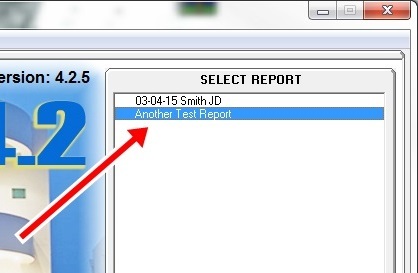 First locate and remember the name of the report you are having trouble with. 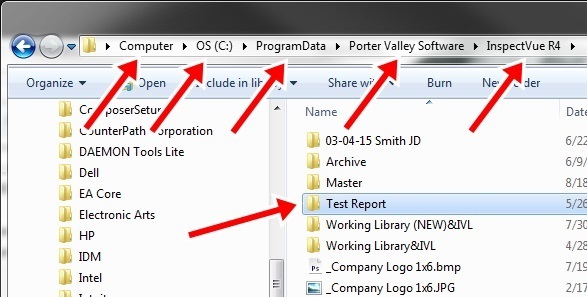 Then locate the folder of the Report you wish to rename. 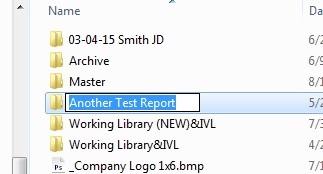 In this case, I will be using the Report called "Test Report"
Once you click "Rename" the name of your report folder will be highlighted and turn blue. 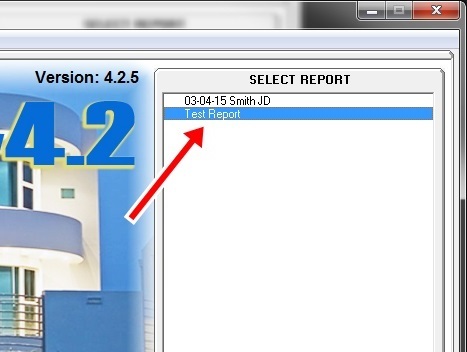 Simply start typing the NEW name of the Report. In this case, lets change it to "Another Test Report"
Once you are finished renaming your folder, hit Enter to accept the changes. Please note: Once you rename your folder it will not remain highlighted in blue as in the image to the left. This was left highlighted simply to easily illustrate that the name had changed. The File Name is the part that come BEFORE the dot and the Extension comes AFTER the dot and tells your computer what type of file it is. It is VERY IMPORTANT that you only change the File Name and not the Extension in any way. IMPORTANT! 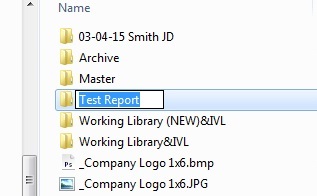 The File Names MUST be named EXACTLY like the Report Folder was. 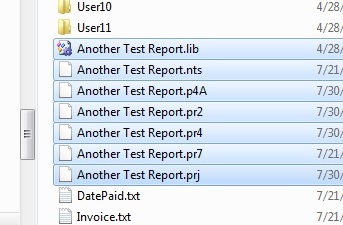 In the example shown, I used "Another Test Report"
Just like you did with the Report Folder Right-Click on a file and select Rename. Once you have changed the File name, hit Enter to accept those changes. 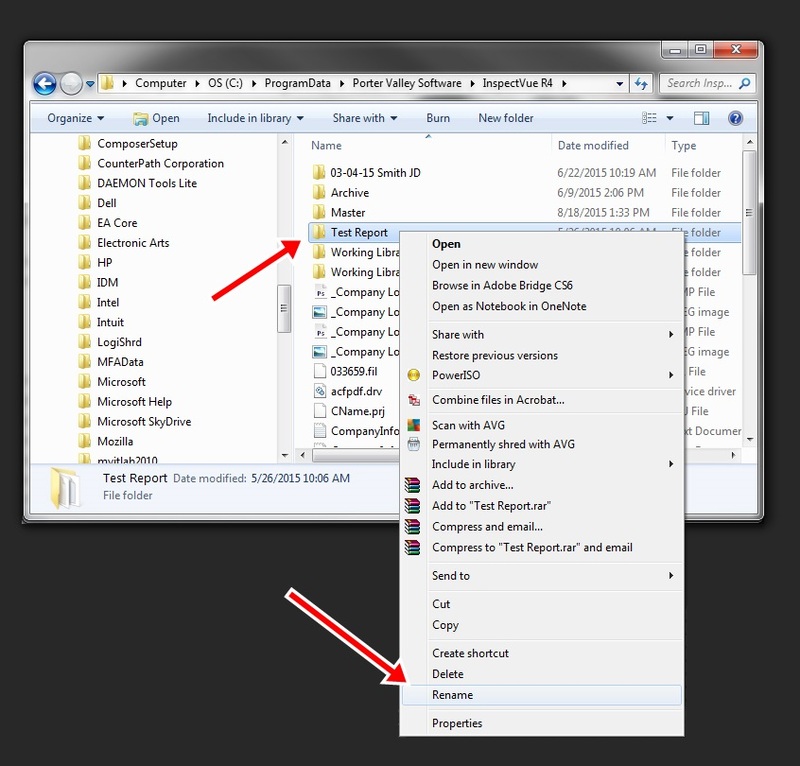 Once you have changed all 7 file names, you can exit out of your file explorer and starting InspectVue. You will now see the renamed Report in the Active Report Section. If for any reason, you are still experiencing trouble, or the report failes to open, or you get a system message stating that your Report "isn't an InspectVue Report", You will need to call Porter Valley Tech Support at (877) 810-5635. This will of course require you to have an Active Service Subscription for Tech Support Personnel to resolve this issue.